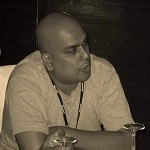 ASP.NET interview questions with answers: - 'Server.Transfer' VS 'response.Redirect' ? Both "response.redirect" and "server.transfer" helps to navigate from one page to other page. 1. User sends a request to navigate to other page. 2. 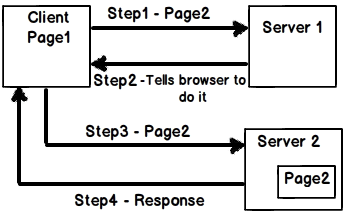 Server creates the page object, executes the complete page life cycle and creates the HTML output. 3. The output HTML response is then sent back to the client browser. Now let's says we want to navigate between pages which reside on different servers. 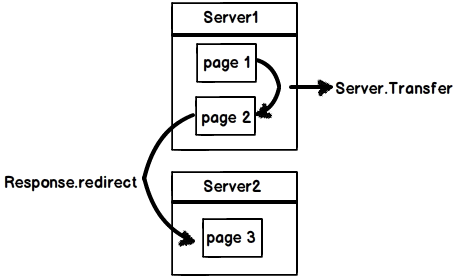 Now in this scenario the server cannot create object of that page as the page is located on some other server. On that external server this server has no control. So for external navigation we need to use "Response.Redirect". 1. Client sends a request to the server to navigate to some other page. 2. Server sends the request back to the client browser telling him to do it as that page is not located in his server. sends the response back to the client browser. Note: - It is possible to use "Response.Redirect" to navigate pages from the same server but then unnecessarily we are making extra round trip to achieve the same. So when to use "Server.Transfer" and when to use "Response.Redirect" ? Use "Server.Transfer" when you want to navigate pages which resides on the same server , use 'Response.Redirect' when you want to navigate between pages which resides on different server. Below is a nice video which explains "Response.Redirect" and "Server.Transfer" in a practical and demonstrative way. We are thankful to www.questpond.com for providing us ASP.NET Interview questions with answers on a daily basis.